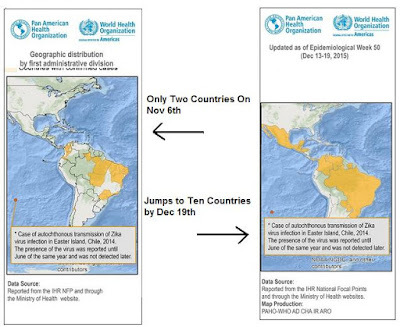 PAHO (the Pan American Health Organization) has updated their locally acquired Zika map for Epidemiological week 50, and we see the number of nations in the Americas reporting the virus has jumped 5-fold in less than two months. Since yesterday, we've seen media reports that two more countries - Martinique and Guyana - have also reported the Zika virus (h/t Crofsblog Two people infected with Zika virus in Guyana and Martinique), but that has yet to be officially confirmed by PAHO. 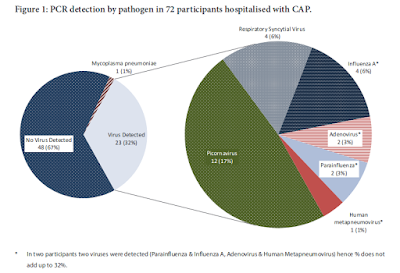 Brazil - which is entering their summer (read: mosquito) season, has been the hardest hit, with the virus first reported there just last May (see WHO WER: Zika Virus Outbreaks In the Americas). Not quite two weeks ago the Brazilian MOH estimated their country had seen anywhere between 500K and 1.5 Million Zika infections (see Brazil Estimates 500K+ Zika Infections). Although most of these mosquito-borne infections are mild and self limiting, over the past several months - concurrent with the arrival of Zika - Brazil has reported an unprecedented increase in microcephalic birth defects and a significant increase in reports of Guillain–Barré syndrome (GBS). While definitive proof is still lacking, the operating assumption is these profound birth defects are likely due to maternal infection with the Zika Virus during the first or second trimester (see ECDC: Complications Potentially Linked To The Zika Virus Outbreaks In Brazil & French Polynesia). Over the past month more than 2000 excess microcephalic births have been registered in Brazil, and those numbers are expected to rise significantly over the months ahead. Meanwhile, countries just now seeing the arrival of the virus are girding themselves to deal with similar public health challenges. Much of Central & South America, along with the Caribbean are at risk. 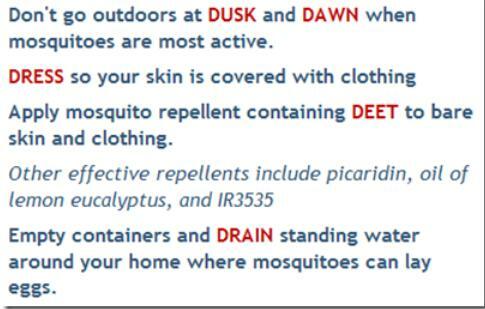 Included also are parts of North America where the two primary Aedes mosquito vectors can be found. The Aedes Aegypti mosquito is pretty much limited to the Gulf Coast states, but the rapidly expanding range of the Aedes Albopictus mosquito covers pretty much the eastern half of the nation. These mosquitoes can carry Dengue, Chikungunya, Zika and other diseases. Despite repeated introductions, and sporadic locally acquired cases, we’ve yet to see either Dengue or Chikungunya establish themselves in North America. In 2003, a CDC EID study suggested that economics and lifestyle may help mitigate locally transmitted Dengue (see Texas Lifestyle Limits Transmission of Dengue Virus). Whether that pattern will hold with Zika (or Chikungunya) has yet to be tested. Anticipating the likely arrival of these emerging arboviral threats, last May the CDC held a Grand Rounds presentation on the topic, which is archived and available for viewing (see Grand Rounds: Preventing Aedes Mosquito-Borne Diseases).